ASME CODE shall be set as lower than MAWP when a Rupture Disc is used as an only safety device, and it should be the size that can prevent increase of pressure over 10% or over 3psi. When multiple devices are used, only one safety device needs to be set to have lower pressure than MAWP. 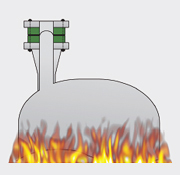 The pressure set for the rest of safety devices cannot exceed 105% of MAWP except FIRE CASE. Pressure container shall have the size that can prevent increase more than 16% of MAWP or 4psi. Rupture Disc device can be installed between safety valve and process or exit of safety valve when sufficient discharge capacity is guaranteed. It prevents leakage through pressure safety valve and protects safety valves from corrosions. 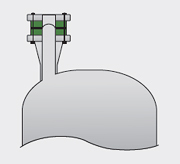 When it is installed at the entrance side, the actual discharge capacity is considered as 90% of the discharge capacity marked at the safety valve (When it is tested under the same conditions, the actual capacity is acknowledged). 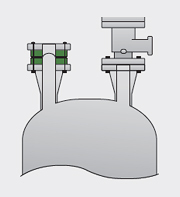 When it is combined with safety valve, the rupture of the Rupture Disc shall not interfere the function of safety valve, and there should be enough space between safety valve and Rupture Disc or a device that can detect pressure (manometer-pressure gauge, Excess Flow V/V, or Pressure Switch). If there are additional hazardous elements such as fire or unexpected external heat, there should be additional pressure discharge device to protect from the exceeding pressure. In this case, it should have sufficient discharge not to increase pressure over 21% of MAWP. Set pressure shall not exceed 110% of MAWP. 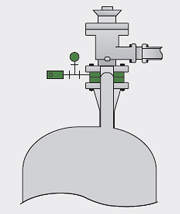 When compressed liquid gas without permanent supply connection is stored in room temperature, it should be able to protect pressure container from external heat sources including fire and the pressure discharge device should be able to prevent pressure increase over 20% of MAWP. ※ MAWP (Maximum Allowable Working Pressure or Design Pressure): maximum pressure that the original performance of the container is not affected. Under normal pressure, it means maximum pressure, while it means minimum pressure in vacuum.